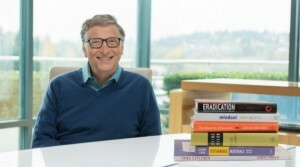 What does Bill Gates read? I’ve always found Bill Gates fascinating. Small minds will focus on his bland way of dressing, somewhat awkward social interaction, and a misguided misunderstanding of his monumental contributions to computers and devices as we know them today. That’s all well and good, and I’m not here to fight with the stereotypes that so many love to clutch, it’s really not relevant here. I find Bill Gates fascinating because he’s always surprising me with some new way to think about something we all think we already know. One of the first truly high-profile billionaires to focus on hands-on charitable work. Malaria, fresh water, financial services for the poor, agriculture… such basic issues that simply weren’t getting the attention they deserved before he stepped in. It’s like his mind just stepped back from everything and sorted out a few neglected yet critical areas that really mattered. Where do minds get ideas like that? From percolating in the thoughts of other minds of course. And the best way to do that is by reading. Stepping outside what you’re more likely to read and jumping on a subject that you’ve never entertained before. That’s why it’s kind of cool to check out what Bill’s been reading this year. I see at least three that I’m going to jump on myself. Maybe you will too. Bill Gates shares his list of best books he read in 2015: “Eradication” by Nancy Leys Stepan, “Thing Explainer” by Randall Munroe, “Sustainable Materials With Both Eyes Open” by Julian Allwood and Jonathan Cullen, “Mindset” by Carol Dweck, “Being Nixon” by Evan Thomas, and “The Road to Character” by David Brooks. This entry was posted in Books, Geeking around, Health and wellness, History, Media, PowerPoint, Presentations, Presenting, Technology, Thoughts, Writing and tagged “Being Nixon” by Evan Thomas, “Eradication” by Nancy Leys Stepan, “Mindset” by Carol Dweck, “Sustainable Materials With Both Eyes Open” by Julian Allwood and Jonathan Cullen, “The Road to Character” by David Brooks, “Thing Explainer” by Randall Munroe, Bill Gates, Reading, Surprise. Bookmark the permalink.